The days pass by swiftly – and the years too – and we have been fortunate to learn a very valuable lesson: – that there is nothing more important in our lives than being close to Jesus. Some things are meant to come and go, but we must always stay close to Jesus. What is our attraction to the Blessed Sacrament but the amazing things that have passed between us and Jesus when we were so close to Him! And Mary, our Mother, what is the secret of her unfathomable growth in holiness but closeness to Jesus (see References). One way to draw closer to Jesus is to adore His holy wounds. 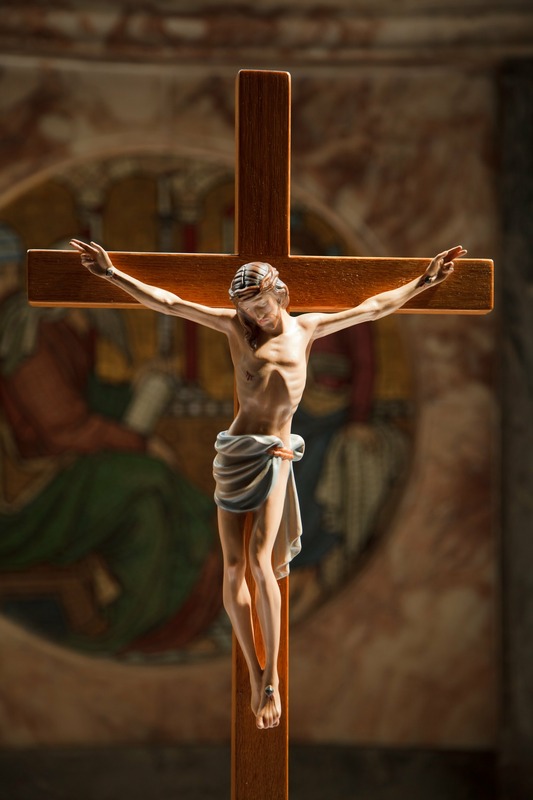 The Passionist priest, Father Ignatius, says that “the lovers of Jesus Christ Crucified manifest their devotion and reverence for Him by tenderly kissing the Crucifix….” (p.40, The School of Jesus Crucified). He urges us to “daily adore the Wounds of your Redeemer” (p.229), and to “frequently kiss those adorable wounds with the liveliest sentiments of affection” (p.228). His chapter on devotion to the wounds of Jesus beginning on page 219 is instructive, and calculated to increase our closeness to Jesus. We know that our Lord’s five wounds were still present on His resurrected body: these wounds, which Jesus took with Him to Heaven, “bear eternal testimony to His Infinite love for us, and are fountains of Charity….” (p. 219; see also for visual meditation The Divine Mercy Image). “Let us, then,” says Father Ignatius, “unite ourselves closely to the most holy Wounds of our Savior….” (p. 223). One quick and easy way to do this is to simply gaze upon your crucifix – and the holy wounds of Jesus – with love and devotion, just as the Hebrew people gazed upon the bronze serpent in the desert in order to be healed (see John 3:14). Once your meditative gaze upon Jesus crucified is over, and whatever words and sentiments have passed between you and Jesus have transpired, you can simply approach the crucifix and end this simple meditation by kissing Jesus’ holy wounds. A simple meditation like this may only last a minute or two, but its value and merit are of profound significance. References: In the first paragraph I am simply condensing and paraphrasing the beautiful words of Father Faber including his profound observations in The Foot of the Cross: The Sorrows of Mary, pages 12-123, on closeness to Jesus. There he states: “But there are moments when we get a transient glimpse in our own souls of what the habitual nearness of the Blessed Sacrament has done for us.” It is Father Faber who reminds us that“Jesus belongs to us.” I recommend Father Ignatius’ book, The School of Jesus Crucified, as a good method to meditate on our Lord’s Passion. By looking upon the bronze serpent, a symbol of Israel’s sins, the Hebrew people were performing a healing and penitential act.